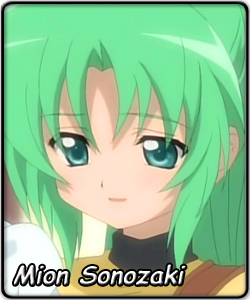 Sonozaki Mion is the heir to the head of the strongest clan in Hinamizawa. Although there are three Great Families that rule this isolated village, all power is effectively on the Sonozaki. Her mother used to be the heir but became disqualified so this job was passed onto Mion. Shion, her twin, was essentially removed from the politics, sent to school in the neighbouring city (Okinomiya). Despite the political tension that should be there between such 'royal twins', they get along very well. Mion lets Shion dress up as her for when she needs to do something in Hinamizawa. Mion would even go so far as to undergo torture to prove her resolution to support Shion's politically incorrect love interest. In the political arena, Mion acts strict and formal. She's also been trained in martial arts and can knock out adult men with her kicks. However, most of her screentime is outside those situations. She is the head of the Club at school - a group of friends who get together for after-school games of all sorts (ranging from board games to physical activities, all with a "penalty game" afterwards for the losers). She refers to herself as "oji-san" (old man/uncle) among her friends and indeed, at times acts like one through her leadership. She has a crush on Keiichi though and secretly wants to be treated as a woman instead of a tomboy.